The regiment was commanded by Lieutenant Colonel Oscar Malmborg at the battle. This regiment was in position here at 5 p.m. April 6, 1862 and bivouacked here Sunday night. Location. 35° 9.025′ N, 88° 19.31′ W. Marker is near Shiloh, Tennessee, in Hardin County. Marker is on Pittsburg Landing Road, on the right when traveling west. Touch for map. 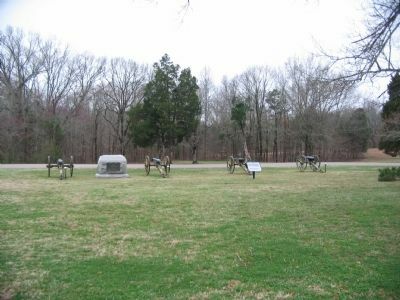 Located between the visitor center parking lot and the National Cemetery at Shiloh National Military Park. Marker is in this post office area: Shiloh TN 38376, United States of America. Touch for directions. The 55th Illinois Infantry tablet stands near the monument and artillery display representing Battery H, 1st Illinois Light Artillery. (within shouting distance of this marker); Headquarters General U. S. Grant (about 300 feet away, measured in a direct line); Army of the Ohio (about 300 feet away); Army of the Mississippi (about 300 feet away). Touch for a list and map of all markers in Shiloh. More. 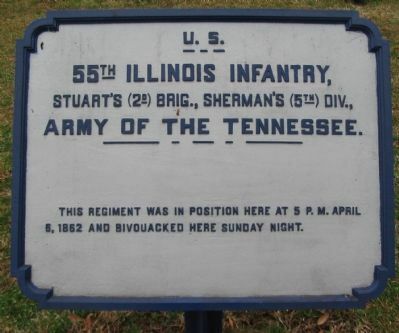 Search the internet for 55th Illinois Infantry. Credits. This page was last revised on June 16, 2016. This page originally submitted on August 2, 2009, by Craig Swain of Leesburg, Virginia. This page has been viewed 803 times since then and 7 times this year. Photos: 1, 2. submitted on August 2, 2009, by Craig Swain of Leesburg, Virginia.